Scanning for wireless networks is now easier and more personalized! AirRadar For mac allows to scan for open networks and tag them as favourites or filter them out. View detailed network information, graph network signal strength & automatically join the best open network in range. 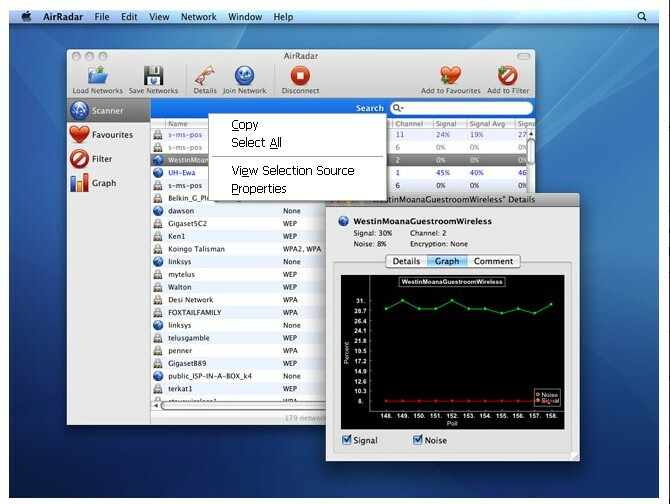 AirRadar for Mac provides a more linear approach to network hunting. Setup a scan frequency, and have new open or closed networks have their name spoken, play alerts. scan for open networks and tag them as favourites or filter them out. ...... Setup a scan frequency, and have new open or closed networks have their name spoken, play alerts, or display notifications. Qweas is providing links to AirRadar for Mac 2.1.5 as a courtesy, and makes no representations regarding AirRadar for Mac or any other applications or any information related thereto. Any questions, complaints or claims regarding this application AirRadar for Mac 2.1.5 must be directed to the appropriate software vendor. You may click the publisher link of AirRadar for Mac on the top of this page to get more details about the vendor.